We absolutely believe .com is the king and always will be but this is one of the very few rare exceptions that we also think is pretty good for the new gtld domain extensions and that actually can work as an alternative to the .com! Annual renewal fees are somewhat hefty at approx $450 USD annually for this category defining domain but we think it's well worth it, in comparison to the 7 figures you would need to pay to have a chance of buying LandForSale.com. The same owners of LandForSale.com sold Land.com to Landwatch for many millions and they also sold HomesForSale.com for almost $3m that was packaged in a deal with HomeForSale.com and HFS.com! Could you rent a prime billboard for the price we are asking for LandFor.Sale? Don't think so. It would cost you that much at least per month for what we are asking. Why is it a new registration you might ask? It's really not, it's a premium domain name that was reserved by the registrar since inception. This wasn't a standard fee hand reg like you would pay for a .com, .net or .org. We had to pay well for it to buy it from the registrar direct as it was a premium domain held by them. There are approximately 110,000 exact match searches done by just US web surfers alone for the phrase: "Land For Sale" on google alone per month, this does not include the other countries globally and all the other search engines like Yahoo, Bing, Ask, AOL, Duck Duck Go and the rest. Remember 110,000 exact match search queries are done on average per month on google alone, now add up all the other countries where this phrase is also searched on google and then add in all the countries including the USA where it is searched also on other search engines. This goes for any search phrase of course. There are over 8.2 billion search results on just google alone, which is absolutely staggering! The CPC for this phrase on google alone is $0.51. If you were to rank this domain top ten on google alone which could be done, you are going to save a pile of money in advertising. 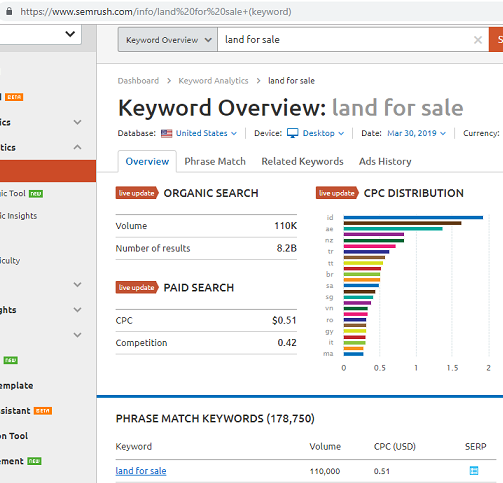 A top ten ranking for the phrase Land For Sale might garnish you from min 10,000 - 50,000 of those searchers, at 10,000 at .51 per click for ppc that is $5100 a month, and at 50,000 of those searches if you are top 3 google that is $25,500 a month and again that is just for google! Take into account your rankings on all of the other search engines and the organic traffic you will get from them as well, great numbers, huge savings! If you use it for a PPC page only google instead of organic search results, your conversions are going to go way up and you are going to pay way less in ppc fees because of the exact match and high conversion rates which is proven when searchers see the exact phrase match in a ppc ad for a domain. Keep in mind these figures don't even take into account the organic seach traffic you will get from Bing, Yahoo, Duck Duck Go, Ask, AOL and all the other search engines out there. Bing and Yahoo have been found to actually bring less bounces and higher converting traffic believe it or not! LandWatch now owns Land.com and dominates the listings online, many realtors pay $100,000 - $500,000 a year and more for listing space on their site landwatch.com alone! Why pay so much when you can do the same with some work and save tons with the domain name LandFor.Sale! Create your stand alone site and get the crumbs from what they are doing! The crumbs can make you a comfortable high 6 figures or more a year! One last thing, it is also shorter than LandForSale.com - It's not better by any means than LandForSale.com no as previously stated, but it's also a tiny tiny fraction of the price of what LandForSale.com would cost you to acquire if you even could get them to sell. You can achieve a lot of the same with this gtld with hard work and time. There are very few GTLD's that can cut it and this is one of the very few.